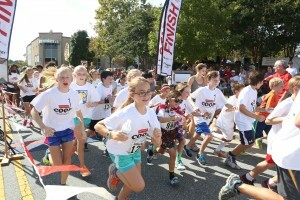 The 2018 Super Cooper’s Rockin’ Run was on September 29 at Southern Village in Chapel Hill. Stay tuned for news about the 2019 race, and Like us on Facebook to keep in touch in the mean time! 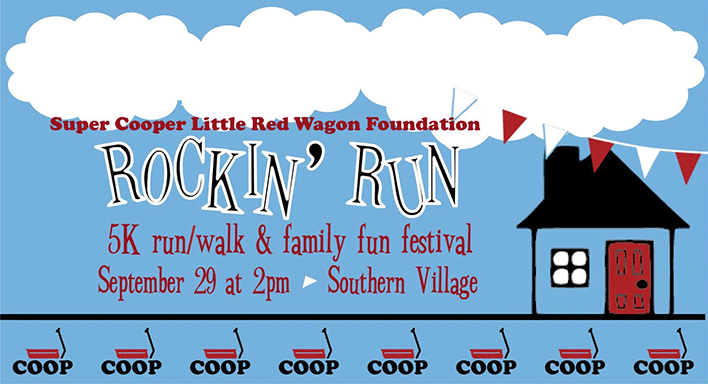 Join us on September 29th for the 2018 Super Cooper’s Rockin’ Run to help us raise funds to provide housing and support to families fighting pediatric brain cancer. This year’s big day will offer fun for all ages beginning with a chip-timed 5K run as well as a kids fun run (Coop’s Dash) to experience a day in the life of a patient. Coop’s Dash will combine a short distance for kids with activities focused on helping kids see life through the eyes of a child in treatment. After all the running and racing, the day continues with amazing food and activities. Your registration includes not just the race but, all the activities. Stay into the evening hours and enjoy the assortment of sweet and savory food trucks and a cold beverage while you listen to some local rocking music. There will be both a silent auction and a live auction with our master of ceremonies, voice of the Tar Heels, Eric Montross. Other activities will include a multi-player obstacle course, human foosball, large inflatables, a game truck, a glamper photo booth, face painting and fairy hair. So join us and come run and have fun while raising money for a worthwhile cause! Your ticket includes the chipped 5K run including Coop’s Climb(final hill challenge), kids’ fun run, all the festival activities including the live band, and a t-shirt. Food and drinks will be available for purchase from a range of vendors. Pick up your packet Friday September 28th from 4-7PM. Location is the Southern Village Green on Market Street in Southern Village. Packet pickup is also available race day from 1-2:30PM on the Southern Village Green. Connect with us on Facebook for all the event news.